There's something disarming about seeing a young man on stage in a dragon costume, especially when they have a chihuahua called Mr Piffles under one arm. You certainly don't expect a surly manner, a well-observed laconic sense of humour and no small amount of close-up magic skills. We last saw Piff The Magic Dragon dazzling a packed audience in a West End squat. Since then, he has tried to fool Penn & Teller and created his latest Edinburgh Fringe show, The Last Of The Magic Dragons. When did you first know you were a magician and why did you stop being "just" a magician? I tried a lot of things and magic was the one that stuck. But after a few years on the corporate scene I realised it was just going to be more of the same parties, weddings and bar mitzvahs. Also, I was fed up of interrupting people for a living, showing them my little tricks and quips like some sort of card trick monkey and then moving on to the next group. I wanted to perform for people who had specifically come to see me, or at the very least, come to see a show. Did you ever have a Plan B in case the magician career didn't pan out as planned? For a long time. I went to university and then I got a job in IT for a couple of years. It was only when I was 25 and had been quite horribly ill that I decided to jack it all in and go for it. In retrospect, it was a strange choice spending so much time setting up the Plan B when I hadn’t given Plan A the time, attention and investment it needed in order to work. You're onto your third Edinburgh show. How does this one compare to your previous ones? Each year I’ve tried to make it more personal. 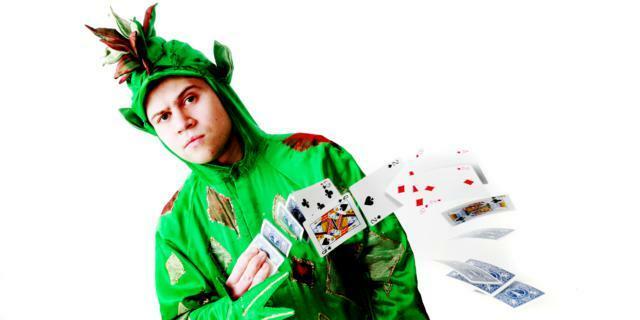 This year the show is called Last of the Magic Dragons, and is about how, as the last of his species, Piff is out to stake his claim as the Greatest Magic Performing Dragon of All Time. Accompanied by Mr Piffles, the World's First Levitating Chihuahua™, Piff will prove he can dazzle like David Copperfield and reach the height of Paul Daniels. You've sold a trick to David Blaine, amongst others. If you had to advise him on his next Blaine-scale stunt in London, what would you suggest? I think it needs to be something that Londoners truly appreciate the difficulty of. Like trying to get a seat on the Central line, or Christmas shopping on Oxford Street. Anyone can hang around in London for days on end without food. Do you have any opinions on dinner cabaret shows? Some people really like them and some not so much. I don’t like anyone eating when I’m on stage unless it’s me. It’s just plain rude to be chowing down and not offering any to an impoverished magical dragon and his barely-fed sidekick. Also, people seem to talk a lot more when the acts are on stage at these shows. I always thought the microphone was a good visual clue as to who should be doing the talking. There are very few magicians we can name who are also Artistic Directors. What is standnotamazed and how do you balance your role there with being Piff? It’s a theatrical cabaret company that aims to use magic in a very different way. We have a few cabaret acts such as this one called The Box and, when we have the chance, we’re also touring our show Love and Other Magic Tricks. It’s a difficult balance finding the time to do it all, but I’d rather be busy than hungry. How long did it take to train Mr Piffles? Has he ever been naughty on stage? I think he was so happy to be rid of his former life as a walking kick bag for an eight year old, he decided to shut up and do what he’s told. Also, I don’t make him do that much. Essentially he just has to sit there and fall asleep. Both are two of his specialist skills. As for the naughtiness, yes, he has relieved himself, live, on stage, on more than one occasion. What are your thoughts on London? I’ve lived here all my life. I grew up in South East London, but I’ve lived all over, North, South, East, West. My favourite place is Maida Vale which is where I currently live. It’s flat, friendly and good dog country. If you were Mayor of London for a day, what would you do? Make it illegal to refuse small dogs entrance to anywhere. They are far more hygenic than most of the four year olds running around the place. I would have some sort of cat flap entrance they have to fit through, or a squirrel holding up his paw next to a sign that said, if you’re smaller than my thumb then in you come. It’s not a health and safety thing, otherwise they wouldn’t be able to make exceptions for disability animals. I went to the Tate the other day and Mr Piffles wasn’t allowed in. Only guide dogs. How many blind people are looking at paintings these days? Given a million quid, how would you improve the London cabaret scene? Only book good acts, and pay them far more. There are too many nights running and the money is not good enough. It means that the acts gets overexposed trying to make ends meet, and terrible acts get stage time in the hunt for new faces. Everyone is trying to be the new La Soiree, but that show is so far ahead of the game. I wish the others would try and make their own marks and focus on quality not quantity. In every show we've seen you in, you always manage to get a pretty lady volunteer up on stage. You must have the sexual charisma of a young Clint Eastwood. What's your secret? A Magic Dragon never reveals his secrets. What are you doing after Edinburgh? A long break or back into the thick of things? I’m booked solid until the end of the year, so right back into the thick of it. Although I’m touring a lot around the country, I’m doing a few nice London shows too. I’m at Madame Jojo's Magic Night on 16th September, which, strangely, will be the first time I have appeared on a bill with Barry and Stuart, and then, even more strangely, on 21st October I’m at the O2 appearing as part of An Evening of Burlesque. Boom!